1 photograph : b&w ; 18 x 22 in. - 1 photograph : b&w ; 10 x 12 in. 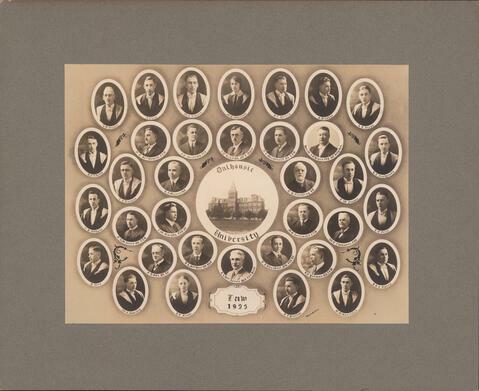 File contains two copies of a composite photograph of the Dalhousie Faculty of Law class of 1925. The photograph consists of portraits of H. B. Dickey; J. Chem; W. A. D. Gunn; S. E. Smith; D. F. Adams; U. C. MacDonald; T. L. Compton; H. F. Munro; T. W. Murphy; D. A. MacRae; H. C. Glube; W. E. Moseley; R. Kerr; F. D. M. Jones; C. P. Bethune; A. S. MacKenzie (President); J. E. Read (Dean); M. G. Wambolt; F. H. Bell; P. T. Hickey; R. Gushue; A. L. Slipp; R. L. Snodgrass; L. W. Fraser; G. H. Fielding; H. C. Friel; W. J. O'Hearn; A. I. MacDonald; V. I. Pearson; P. R. H. Barry; W. E. Thompson; M. B. Archibald; C. J. Burchell; R. F. Yeoman; and G. M. Morrison arranged around a photograph of the Forrest Building. One copy is mounted on a matboard. The other copy has remnants of glue on the back of it.